This post has been a long time coming. So long, that we're almost at Christmas rather than Canadian Thanksgiving, when I first made it, hehe. Sorry about that. Sometimes I never know where my head is at. Especially in December, when its a busy month, and crazy even by my usual laid back standards. We decided to stay home, just the three of us for Christmas this year. Over the last few years, we've hardly spent Christmas by ourselves. Two years ago, we were in the throes of the big move, and ended up spending Christmas in India. It was a big deal for me then, as that was my first Christmas back home in 10 years. The next year we had a whirlwind of a Christmas, with all the driving to Terrace and back in a week. So this year, I am kind of looking forward to a more relaxed week, hanging out with friends and spending Christmas with the people I love very much. I don't do vegetables as much as Kay and Aditi. Its ironic, really, as the majority of the time I have vegetarian recipes on the blog. I make an exception for squash though. Butternut and acorn are my favourite kinds, and I do like that I can buy a few at a time from the markets, and use them through a couple weeks. 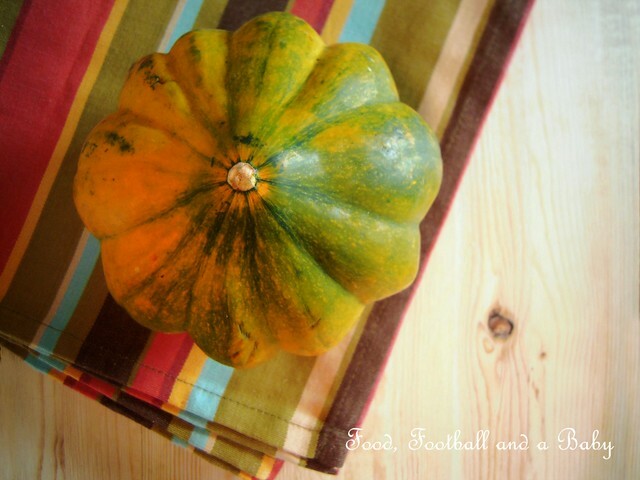 My usual recipes for squash are soups, spicy and roasted, in particular. On the days I want to go easy, I go with simple roast squash with olive oil and herbs, and maybe a spice or two. And then there is this recipe. So simple, yet the way the elements of this dish come together is nothing short of amazing. 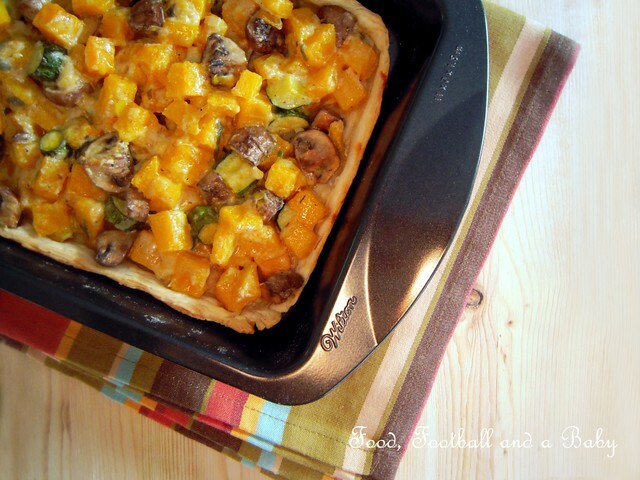 The sweetness of the squash pairs perfectly with the earthy mushrooms and delicate zucchini. The garlic cream sauce adds another level of flavour, and the rich, buttery puff pastry just wraps everything up perfectly. The colours are gorgeous, and make me happy on a dull, miserable day. And the method of making it couldn't be more simple. The longest part of it is the time it bakes in the oven, during which you can clean up and throw together a light green salad to go with it. Roll out the puff pastry into a rectangle, roughly 13 inches by 9 inches. Peel and chop the squash into small cubes. Wipe down the mushrooms and the zucchini and cut into the same size cubes as the squash. Keep aside. In a pan, heat the butter, and saute the onion for about 7 minutes, until soft but not coloured. Add the garlic, and cook for another 30 seconds. Pour in the half and half, and add the grated nutmeg, salt and pepper to taste. Stir together, and heat until the cream is just thickening. Add the squash, mushroom and zucchini to the onion-cream mixture, and stir to coat. Cook for about 2 - 4 minutes, topping up with a little extra cream if the mixture seems to be drying out too much. Take off the heat and cool completely. Meanwhile, place the rolled out pastry sheet on a baking sheet, lined with parchment paper. Very gently ladle the squash mixture over the pastry, leaving about an inch and half from the edges. 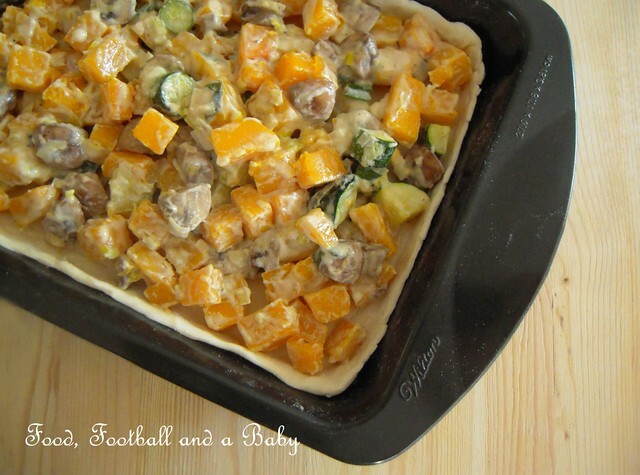 Place the tart in the preheated oven, and bake for about 25 - 30 minutes, until the pastry is golden and risen around the edges and the squash is soft. Looks delicious. Food is notoriously hard to photograph well but I think you do a great job. Helps when said food looks scrummy anyway! That looks incredibly delicious!! Bookmarked to bake! !